The graph shows the percentage of Chinese population living in urban areas until 2017. In 2017, about 58.52 percent of the total population lived in cities. Urbanization is generally defined as a process of people migrating from rural to urban areas, during which towns and cities are formed and increase in size. Even though urbanization is not exclusively a modern phenomenon, industrialization and modernization did accelerate its progress. 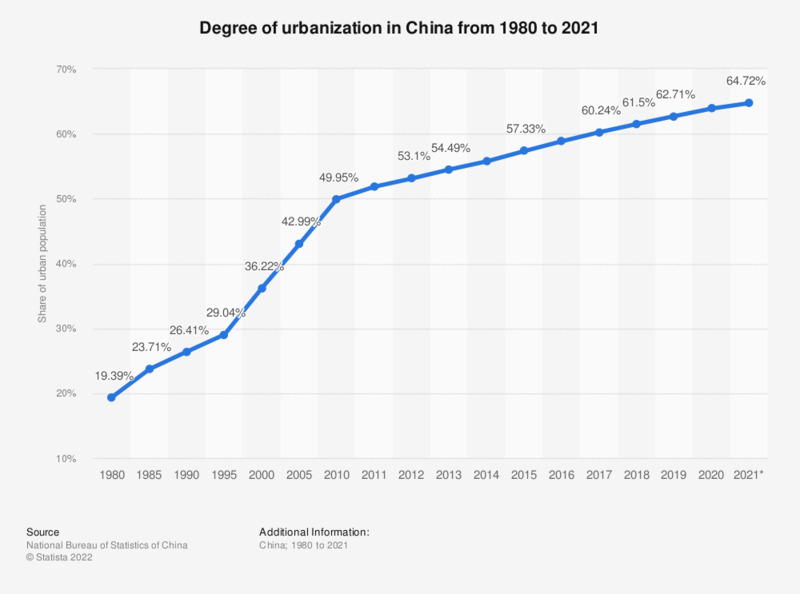 As shown in the statistic at hand, the degree of urbanization of China, the world’s second-largest economy, rose from 39 percent in 2002 to around 53 percent in 2012. In 2011, the urban population surpassed the number of rural residents for the first time in the country’s history. According to the urbanization blueprint, issued in March 2013 by the Communist Party and State Council, China aims at reaching 70 percent urbanization by 2030. Brazil and Russia, two other BRIC countries, display a much higher degree of urbanization than China. On the other hand, in India, the country with the worlds’ second largest population, a mere 31.7 percent of the population lived in urban regions as of 2012. Urbanization is further advanced in East China regions than in Central or West China. Among the ten largest Chinese cities in 2010, seven were located in East China. That year, Shanghai ranked as the seventh largest city worldwide. It was also listed as one of the strongest growing metropolises in the world in terms of income and employment increase. Similar to other parts of the world, the progress of urbanization in China is closely linked to modernization. From 2007 to 2017, the contribution of agriculture to the gross domestic product in China shrank from 10.77 percent to 7.9 percent. Even more evident was the decrease of workforce in agriculture.